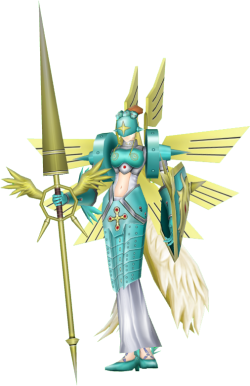 Ophanimon is an An Ophan Digimon that is the final form of female Angel Digimon. It is one of the Three Archangel Digimon who protect the Digital World's core "Kernel" (God's domain), alongside Seraphimon and Cherubimon. As the Digital World's Holy Mother-like being, it imparts the loving and merciful side of God, while Seraphimon is the executor of the enlightened God's laws, and Cherubimon is the guardian of God and His wisdom; each has their own duty. Its Special Moves are "Eden's Javelin" and "Sefirot Crystal". Sefirot Crystal Light attribute 5 seconds cooldown 170 DS consumed skill points per upgrade Learned at Lv. The digimon summons 10 blindingly shiny crystals from the shield in the left hand, attaches them to the enemy and explodes them. Eden's Javelin Light attribute 7 seconds cooldown 262 DS consumed skill points per upgrade Learned at Lv. The digimon fires forth from the holy spear in the right hand a ray of holy light that pierces the evil heart of the enemy. This page was last modified on 23 March 2019, at 13:52.